After the useless March international break, Serie A returns and the home stretch begins: the next eight games will decide the Scudetto winner as Juventus are hanging on a small three-point lead over Napoli. As we have seen with the brouhaha after the controversial calls in the Derby della Mole, the situation has already heated up and it will not quiet down, probably until Euro 2016, I guess. Giorgio Chiellini has indicated April 25th, three weeks from now, as the key date for the title race: Juventus will visit Florence, while Napoli will face Roma on the road. 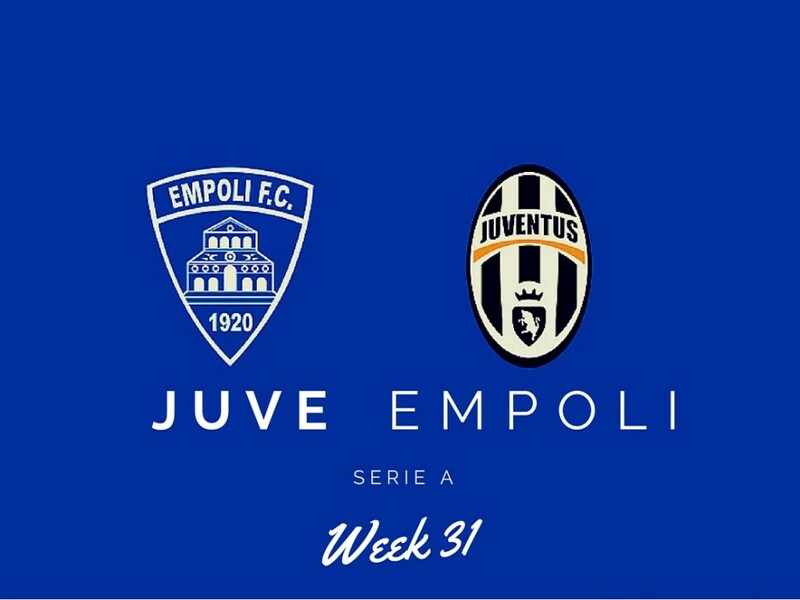 The definitive verdicts will likely arrive on that day and, in the meantime, the Bianconeri will try to expand the gap right from this weekend as they host the fading Empoli, while Napoli travels to Udine, a city where victory has eluded them in recent years. The two-week pause did not really help heal wounds as there are more banged up players now than before. Luckily, everybody avoided major injuries, but there are several doubts heading to the Saturday game and the lineup is still up in the air. Let’s start with the certainties: Leonardo Bonucci, Alex Sandro and Sami Khedira will miss the match because they are suspended. Bonucci and Khedira are hurt too: the defender has a sore groin that forced him out of Germany-Italy, but it could have been worse. Khedira, who will start serving a two-game suspensions for cussing at the referee the club has appealed against, sat out that game because of muscle fatigue and has yet to take further tests. The list of players who are ailing is long and somebody will inevitably have to bite the bullet. 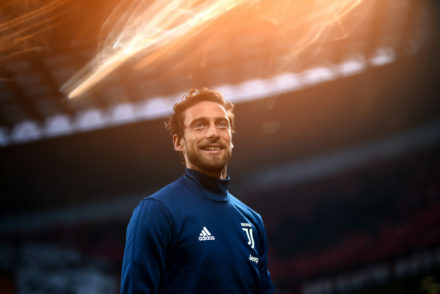 Claudio Marchisio is dealing with a calf strain and he is not expected to play this weekend, but he should be ready for the Milan bout next week. Hernanes is slightly favoured to replace him, should Juve use a three-man midfield because he spent the break in Turin, while Mario Lemina was with Gabon and this is a pet thing coaches like to do. Giorgio Chiellini has recovered. Patrice Evra has a bruised tibia and Stephen Lichsteiner a bad calf, but they should gut it out. The most uncertainty involves Andrea Barzagli and Paulo Dybala: the centre-back made a quick trip to Italy HQ in Coverciano but returned to Vinovo because of a fatigued hamstring. Paulo Dybala, who left the Torino game with a similar ailment, travelled all the way to Argentina, but made the trip back because he was unable to play. The early reports indicating he suffered a strain were quickly dismissed, likely it was just a translation blunder, but it is said that the coaching staff will be cautious. The fact that he missed the Bayern clash, although with a calf problem, and then played four days later was a bit suspect to me. The absence of Dybala would not be a big problem as Alvaro Morata is in good form and Mario Mandzukic and Simone Zaza are available as well. 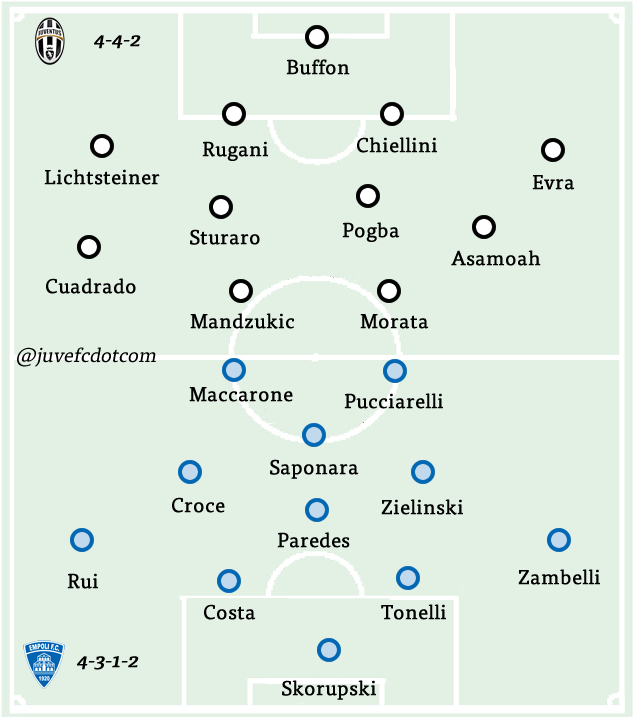 However, Barzagli missing the game would most likely force Massimiliano Allegri to move away from 3-5-2. I guess Lichsteiner could play as RCB, but that is not really ideal. An interesting wrinkle to keep an eye on, in case Barzagli recovers, is whether the coach will entrust Rugani with the Bonucci role: Allegri has gone back and forth on whether the youngster can take on those responsibilities that are not strictly defensive. There seems to be some optimism about Barzagli but the fact that he has yet to re-join the rest of the group two days before the match worries me. Not having him would open up three different tactical scenarios, all involving a four-man defence: 4-4-2 with Cuadrado and Asamoah, 4-3-1-2 with Stefano Sturaro in the midfield and Roberto Pereyra in the hole, 4-3-3 with Cuadrado and Morata as offensive winger. The first one is reportedly gaining steam, with the alternative of Pogba slotted as tactical left winger and Hernanes in the middle. UPDATE: Dybala has not been called up, while Barzagli and Marchisio are in the squad list, but not expected to start. Allegri talked up Pereyra in the press conference and the favourite lineup as for right now is 4-3-1-2. 4-4-2: Buffon; Lichsteiner, Rugani, Chiellini, Evra; Cuadrado, Sturaro, Pogba, Asamoah; Mandzukic, Morata. 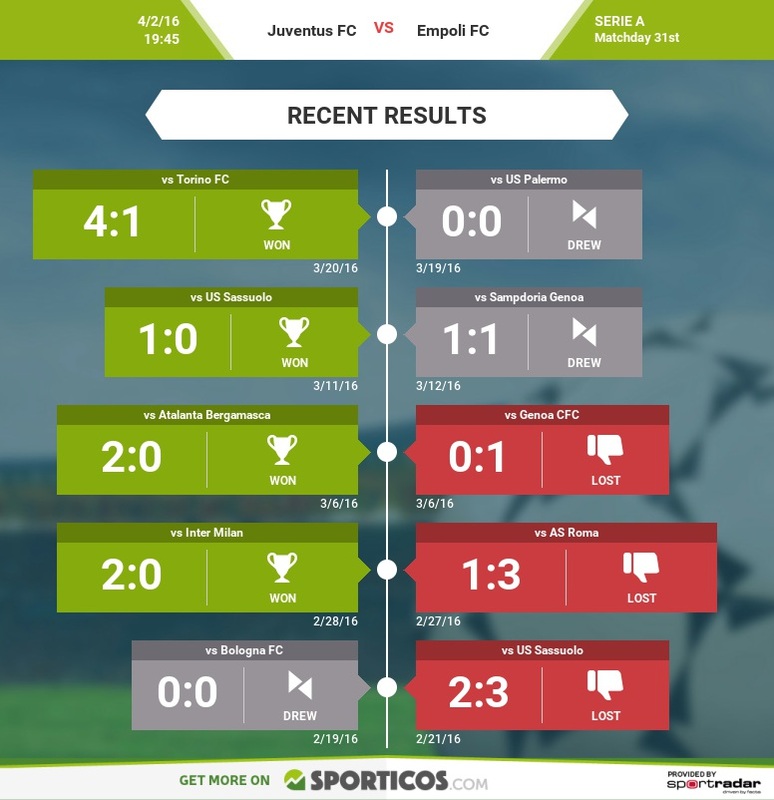 Empoli, after a so-so start, had a really nice run in December that catapulted them in penthouse of the table. Unfortunately, they quickly realized that they could not compete with the top teams vying for a European spot, and fizzled out. They have not won in the last eleven matches, mostly due to lack of motivation. In this period of the season, we see numerous teams that are stuck in no man’s land, comfortably above the danger zone but distant from the top six, therefore having nothing to play for. Still, considering all the summer changes and gambles, it has been a remarkable season for them. They lost their mastermind Maurizio Sarri, half of the defence (Elseid Hysaj and Rugani) and half of the midfield (Mirko Valdifiori and Matias Vecino) and they are still having a better year than the last one. Five of their seven best players and an outstanding coach left to join top teams, but they did not flinch. Hiring Marco Giampaolo, who was navigating in the lower leagues, was a big risk but it panned out. Giampaolo kept the same system in place, accommodated the newcomers and made it look like nothing changed. I think that his best call was replacing the early revelation Assane Diousse with Leandro Paredes as deep-lying playmaker not for performance-related reasons, but to change the style of the team. The move gave them a very technical midfielder, also composed by Piotr Zielinski and Daniele Croce or Marcel Bucher, that is really their driving force. Riccardo Saponara cooled off after a scorching hot start, he has not scored since mid-December, but he is still their best player and their main source of offense, and the attack mostly play off him. Massimo Maccarone is still doing his thing at 36 and Manuel Pucciarelli is serviceable. Saponara is probably not that top player he was deemed to be in September but I would still take him as a back-up advanced midfielder, should Juventus make the permanent move to 4-3-1-2 in the summer. They do not rotate the starting XI much and they will have basically all the starters at disposal. Lorenzo Tonelli visited Germany earlier this week to get treatment for knee tendinitis, but he is said to be available. Vincent Laurini suffered a hamstring strain before the break: Empoli is pretty underreported, but the usual timetable for this type of injury indicates that he is unlikely to play and he will be the lone absentee from their usual XI. The veteran Marco Zambelli is the frontrunner to replace him. Uros Cosic and Marko Livaja are sidelined with injuries as well, but they are fringe players. 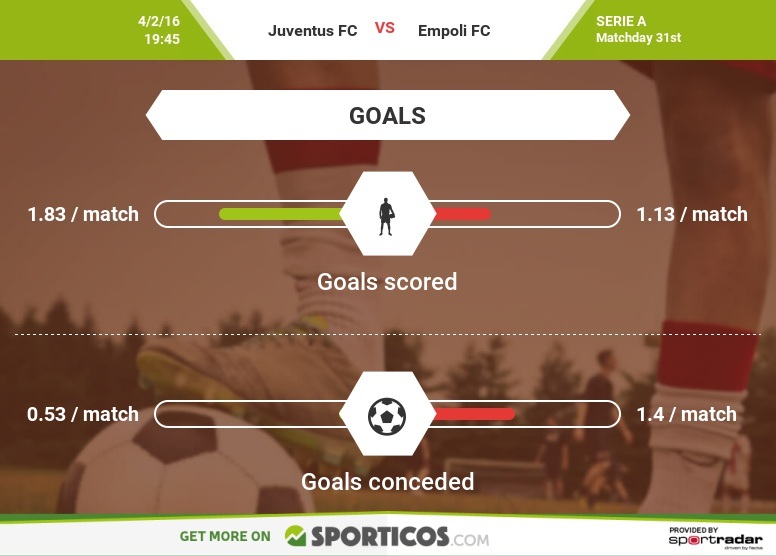 Empoli underperformed in the past two months because of a lack of objectives: we will see whether they will do better on Saturday night in a big spot. Their sporting director Marcello Carli stated that they would like to do Sarri a solid and stop Juventus, but I personally do not buy much into that stuff. We can expect them to attack through the middle, as their diamond lineup suggests, even though the fullbacks, especially Mario Rui, are pretty active. Considering the amount of quality players they have, Juventus will have to watch out for the through balls by midfielders. They usually utilize a high offside line. Their defence, while still decent, is not as stout as the past season and they have often given away leads. The goalkeeper Lukasz Skorpuski is a trick-or-treat guy: you never know in advance whether he will have a great performance with three spectacular saves or if he will botch some basic stuff. He is bothered by elbow bursitis. UPDATE: Levan Mchedlidze will miss the game as well, so they will be pretty short-handed in the attack. Saponara is a little fatigued but he should play. 4-3-1-2: Skorupski; Zambelli, Tonelli, Costa, Rui; Zielinski, Paredes, Croce; Saponara; Maccarone, Pucciarelli. Laurin (hamstring), Cosic (hamstring), Livaja (appendix), Mchedlidze. 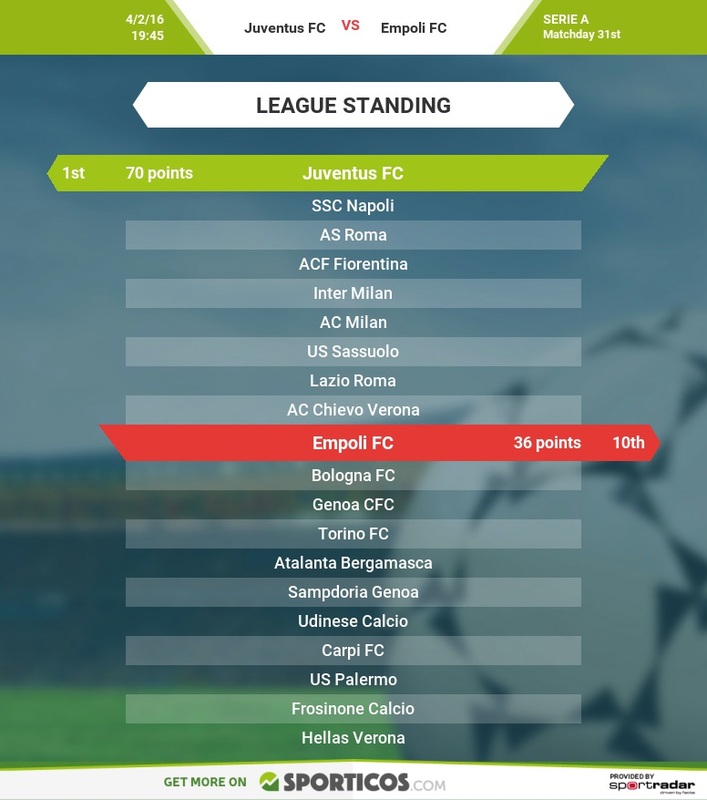 Juventus 1-0 Empoli…Room for improvement.